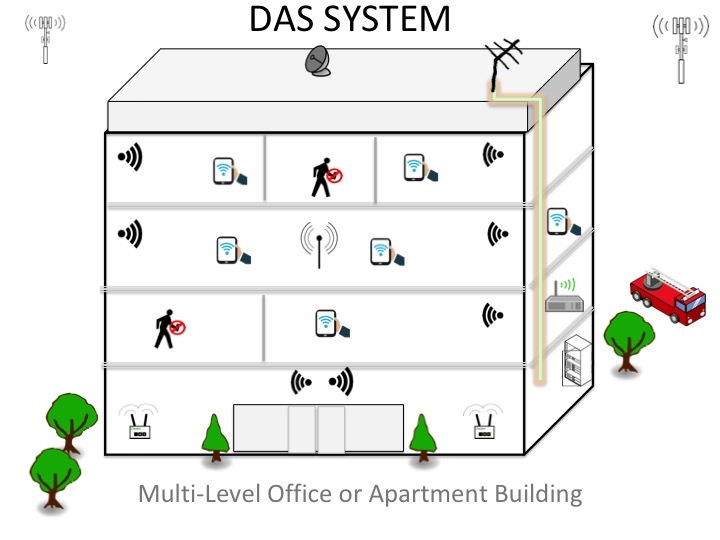 Ideal solutions for cellular, WiFi and Public Safety radio service in multi-story buildings. Mobicel Systems, Inc assists the property developer, manager or owner in resolving marginal cellular, WiFi and Public Safety radio signal levels and wireless coverage within multi-story apartment buildings. Following a site survey, the experts at Mobicel Systems, Inc can recommend a customized Distributed Antenna System (DAS) solution which totally eliminates dead spots in cellular and WiFi coverage. MOBICEL® insures that your in-building wireless coverage solution fully Integrates with local mobile carriers, WiFi equipment and public safety. No matter what you try or what you spend, problems with dropped calls, marginal WiFi coverage and inconsistent internet connectivity keep cropping up. Dealing with multiple service providers and complying with public safety requirements add to the headaches. For property management companies and building owners, providing secure WiFi coverage and seamless internet indoors and in public areas can be a huge and expensive challenge. Cellphone coverage is often limited due to the existing building design and construction, distance from the carrier's tower and line of sight limitations. The building may not even conform to existing public safety radio standards. With careful design and planning, a few wide band antennas and specialized radio transceivers can be strategically located, minimizing interference while maximizing radio signal reception. Most of the equipment and cabling can be concealed, including small un-obstrusive antennas deployed in hallways, basements, roof tops and near entrances to public areas on the property. The building owner or property manager cannot afford to wait on the local carriers to ever improve the indoor signal level and/or eliminate coverage gaps inside the typical multi-story residential building. Local building codes now require inspection and verification of compliance with public safety communications standards. Marginal mobile phone service is the Number 1 complaint from residents and guests that move about the facility. Copyright © 2018 Mobicel Systems, Inc. - All Rights Reserved.